Life at Camp Bondsteel is never dull! During my time there I helped Fr. LaVoie as much as possible and assisted him with some of his daily duties. In fact, it seemed that God had me there at exactly the right time - as Fr. LaVoie got sick one day and I was able to tell him to simply go back to bed - I'd take care of Mass and other things in the office. But I also had the opportunity to take part in the weekly staff brief. It was a good experience - to see how the planning and execution phases come together in order to support a mission. Occasionally the leadership offers a "staff trip" - an opportunity for soldiers to get off the base and visit the local sights - but it is not just a morale trip - but a chance to understand the history of the region and why NATO forces continue to be present. The answer to that question is intricately related to Kosovo's history, I believe. After this we headed to a statue of Milos Obilic - a Serbian nobel who killed the Sultan Murad the First during the Battle of Kosovo in 1389. Well... at least that is the Serbian version of the story... Do you remember learning in high school history class that "the victor writes the history"? Well, here is case and point - and a good witness as to why this conflict has gone on and why NATO forces are still needed in this region of the Balkans. According several versions of Serbian history, Milos Obilic "pretended" to be dead on the battlefield OR a deserter. Regardless, when the Sultan Murad came by, he managed to kill the Sultan with a poison dagger - thus triumphing (at least symbolically) over the much stronger Ottoman forces who greatly outnumbered them. (The other side of the history will come a little later on in this post...) So, in this area of Kosovo - the Serbian town of Gracanica - there is a statue in the center of the town honoring the heroic deeds of Milos Obilic. As you can see, at each place we were given a "brief" by a member of our group. Next we went to the Serbian Orthodox monastery of Gracanica - which was built in 1321 by the Serbian King Stefan Milutin on the ruins of a 6th century three-naves basilica. It has beautiful icons within, but we were not permitted to take photos inside - so you only get the outside and the grounds. The monastery, like other Serbian monuments and religious houses, has long been guarded by KFOR forces and kept from destruction. 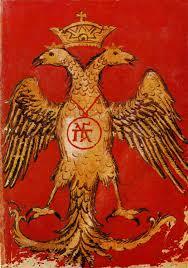 A church bell with the two-headed eagle - symbol of the Serbian Dynasty (1300's) and of Albania (on their flag). Are you starting to see some areas of "conflict" between Serbians and Albanians? Continuing the Serbian version of history, we next traveled to the Serbian monument to the Battle of Kosovo - Gazimestan. It was built in 1953 under the authority of Yugoslavia (former Eastern Block country). It is shaped like a medieval tower. Every year, on June 28, a commemoration is held at the monument. It is another area guarded by KFOR to protect it from being destroyed (again) by opposing forces. It was at this monument that Slobodan Milosevic in 1989 (the 600th anniversary of the Battle of Kosovo) delivered a speech that many say sparked the violent surge in nationalistic and ethnic tensions that ultimately led to the breakup of Yugoslavia. In that speech he said, "Whoever is a Serb and of Serb birth and of Serb blood and heritage and comes not to the Battle of Kosovo, may he never have the progeny his heart desires! Neither son nor daughter. may nothing grow that his hand sows! Neither dark wine nor white wheat and let him be cursed from all ages to all ages." He ended the speech with: "Let the memory of Kosovo heroism live forever! Long live Serbia! Long life Yugoslavia! Long live peace and brotherhood among peoples!" The speech was very well received by the crowds who had gathered. Reports say that some shouted back "Kosovo is Serb" and "We love you, Slobodan, because you hate the Muslims." See the origins (or at least the spark) of the 1998-9 Civil War? Next on our agenda was the place where Sultan Murad's internal organs are buried. As you know from earlier on, he was killed on the battlefield. It was necessary to return the Sultan's body back to (what is now) Turkey. But in those days (1389) that was not an easy task. So to facilitate it, they removed his internal organs and buried them in (what is now) Kosovo - while his body returned to Bursa. The tomb has become a place of religious significance for Muslims. Despite his murder by Milos Obilic (see above), the Sultan's forces were triumphant in victory and freed the peoples of the Balkans by bringing them under Ottoman rule and protection (are you seeing another version of history here?) Because of this great victory (depute his death), this tomb is revered and visited by Muslims to this day (there were quite a few visitors the day of our visit). Lastly, we ended up at the location (now a memorial) where the the KLA (Kosovo Liberation Army) leader, Adem Jashari, was killed by Serbian police forces. The KLA is either a terrorist group OR freedom fighters - it depends which side you are on. Kosovo was a province of Serbia - and the historical heart of Serbian culture and politics. But, over the course of the past 200 years, the population of Kosovo became majority Albania (and Muslim), leaving only "pockets" of Serbians and Serbian Orthodoxy. When Slobodan Milosevic (see above) he removed all autonomous power from Kosovo - and, as his speech indicated - advocated Serbian control over the region. Kosovar Albanians did not take this well, and organized peaceful protests. 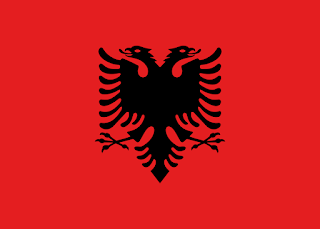 As Yugoslavia feel apart (along with the rest of the Soviet-block countries), the KLA emerged and called for Kosovo to be set free from Serbia and become Greater-Albania. Things deteriorated into violence (each side attacking the other for perceived - or real - grievances or atrocities). Eventually Serbia had enough and went in with force to capture the KLA's head: Adam Jashari - and attacked his home - killing nearly every member of his family. His home and surrounding grounds is now a monument. Hopefully you can see the deep-seated, but every ready to boil over, roots of ethnic conflict that still exists today.